The tour of Top Hat the Musical starring Summer Strallen and Tom Chambers is transferring into London’s West End opening at the Aldwych Theatre on 19th April next year and currently booking until 26th January 2014. 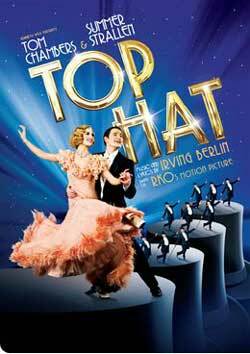 Top Hat is a new musical version of the Fred Astaire and Ginger Rogers movie Top Hat, with music by Irving Berlin.The 1935 film of Top Hat is about American dancer Jerry Travers (played by Astaire) who is working in London for producer Horace Hardwick . When practicing his new dance routine late one night in Horace's hotel he wakes the sleeping Dale Tremont (Ginger Rogers) in the room below. She knocks on his door to complain and the pair are immediately attracted to each other, but there are complications when Dale mistakes Jerry for Horace who is married to her friend. Top Hat the movie had five songs: Isn’t This A Lovely Day (To Be Caught In The Rain), Cheek To Cheek, No Strings, Piccolino and the title song Top Hat (White Tie And Tails). The production team (director Matthew White, choreographer Bill Deamer and producer Kenny Wax) have also included Let’s Face The Music And Dance and I’m Putting All My Eggs In One Basket. Booking is already open and although it is expected that most of the cast will transfer into London the final list is still to be confirmed.